PAGANA is a maranao way of welcoming or entertaining visitors and guests to show their hospitality. They are accommodated in an elaborately decorated venue, served food and entertained with local songs and dances. Guests are expected to be elegantly dressed for the occasion with the host often times providing malongs or tutubs to guests who do not have one. And I'm probably still full to explain what transpired during the day, so here are few decent pictures I took during the event. Several bands played to keep the guests entertained. We had a great time with the jam. My not-so-little sister really had fun dancing with the bit of every song played. So here are few of the dishes I/we had.. Chef Rod's | Baby Back Ribs served for only Php 80.00 without rice. Yummy! Best served with freshly cooked rice. Flamoo | Pagana served for only 95.00 a double patty burger served hot and spicy with shoestring fries on top. I brought one home for mom and dad and they really loved it! El Canto's | Chicken Barbecue meal for only Php 69.00. My not-so-little sister was not able to consume everything, that's how big each serving is. Super SULIT and very tasty. The sisig was so inviting too. And of course how can I forget my all time favorite? Aruma Kissaten's | Cafe Mocha. Lai also had her Cafe Americano after the not so glautonic dinner. Those were just a few of what we had tonight. We also had Zoey's Cafe's potato twister and black gulaman, which is not in the picture, hmmm I apologize for that. I might grab some photos from Travel Jams once it's up hehe. A lot of members of the IHARRA was there. Iligan Paradise Resort and Eco park team was there too. So there! I really had fun today. 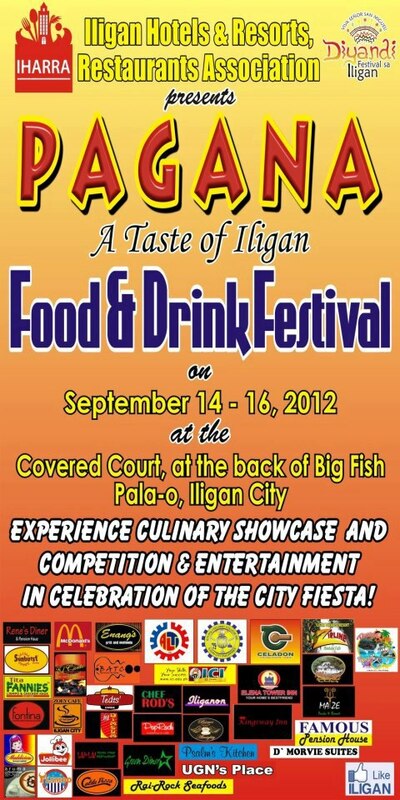 So hopefully you guys can visit PAGANA A taste of Iligan Food and Drink Festival at BigFish Pala-o Iligan City (beside the strip). They are open starting 6PM until 12 midnight from September 14 until September 16, 2012. Disclosure: This post was created in partnership with IHARRA. All opinions expressed in the post are my own and not those of MEMBERS OF IHARRA.